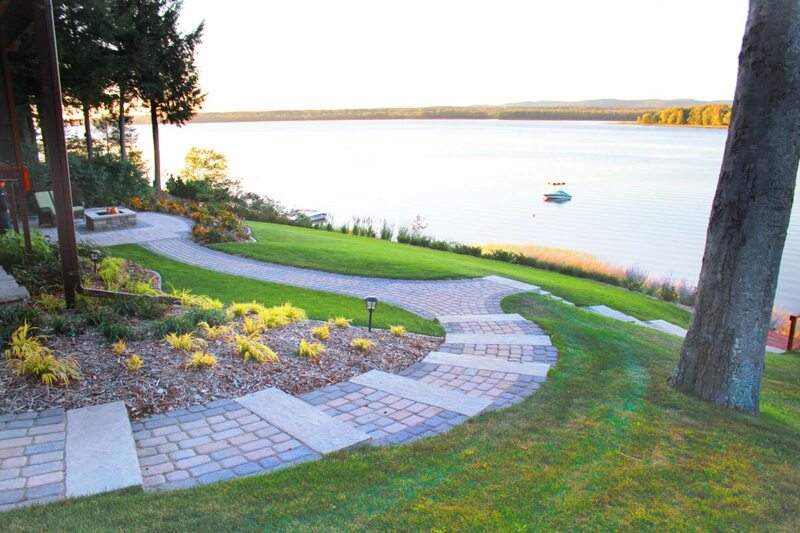 In Ottawa, landscaping is key to getting the most out of the summer season. 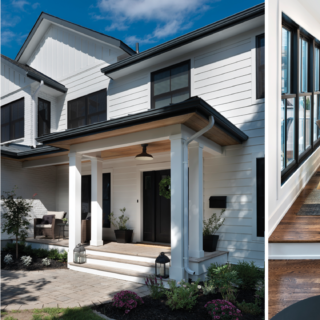 Here, Ottawa Magazine talks to Exact Landscapes president Jamie Carriveau about some of his favourite projects — and how his team transformed underused spaces into backyard oases. 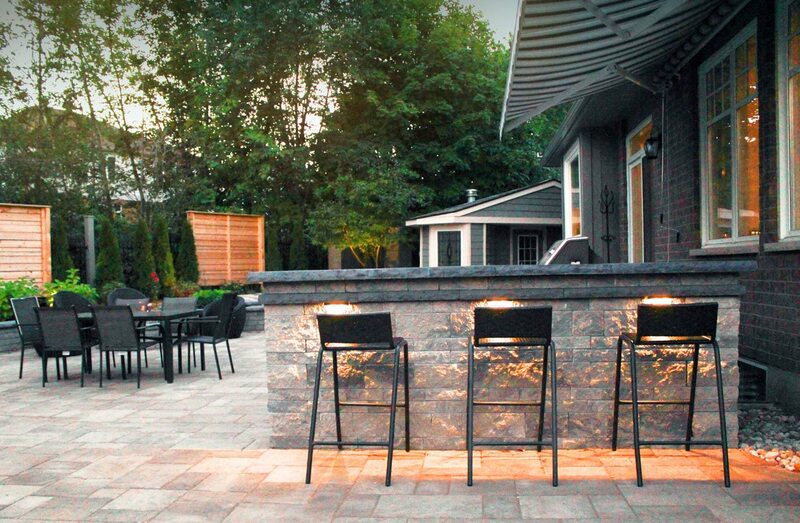 For 13 years, Exact Landscapes Ottawa has been designing and constructing beautiful backyards. In doing so, president Jamie Carriveau and his experienced landscaping team have been recognized for three consecutive years with Landscape Ontario Awards of Excellence. 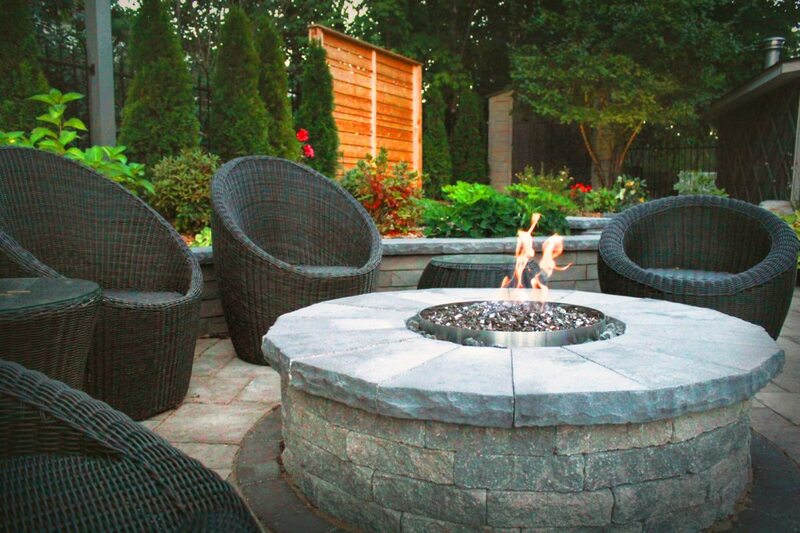 With pools, patios, pergolas, fire pits, plantings, paving, lighting, and outdoor kitchens, they turn backyard dreams into realities. 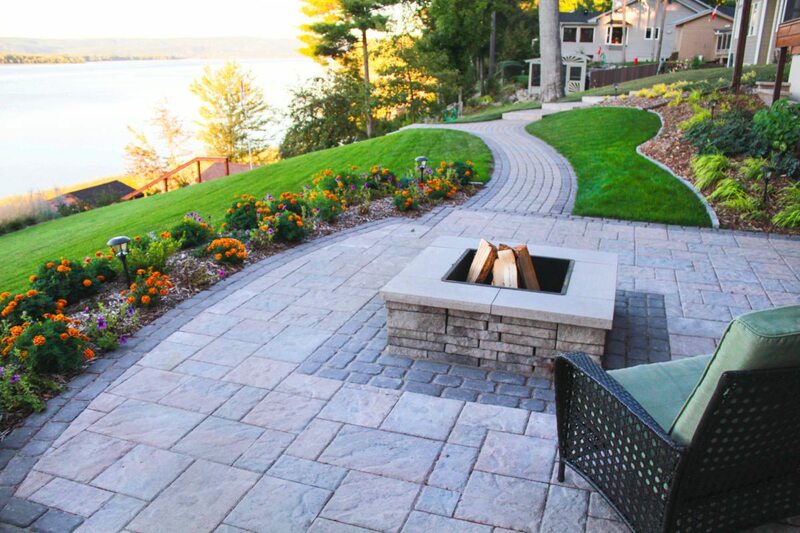 Exact Landscapes also promises peace of mind — working with trusted partners to oversee every aspect of each job. 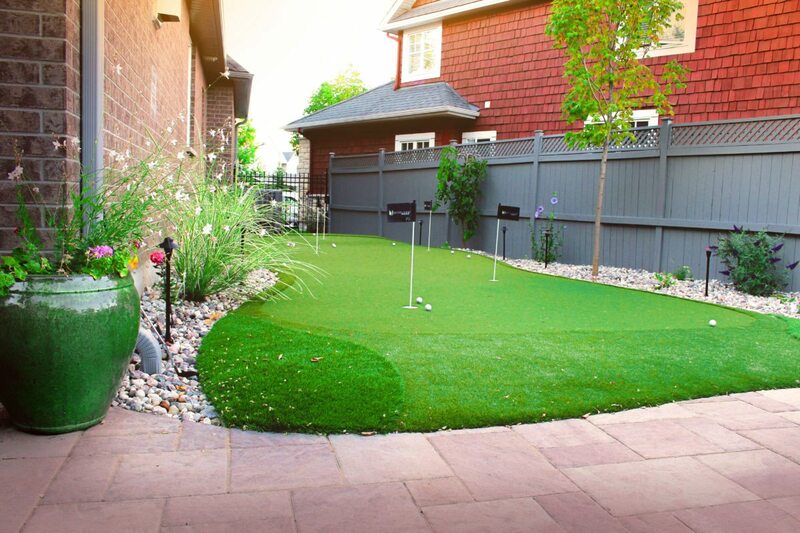 It’s that kind of dedication that has helped to build their reputation as a leader in backyard landscaping, evidenced by rave reviews on Houzz and Facebook. But as they say, a picture is worth a thousand words. Here are a few photos of Carriveau’s favourite Ottawa landscaping projects, which demonstrate how spaces can be as unique as they are fun. Not long ago, this backyard was empty but for a few trees. What a difference! 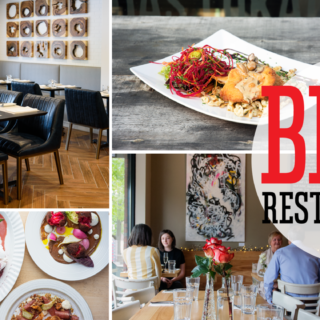 By working closely with the client on detailed design plans, Carriveau brought the vision to life. “Jamie understood all my requests, and that’s not easy because sometimes I was not even very clear on what I needed! His design perfectly matched my imagination,” says homeowner Jingyu. With lots of space to work with, Exact Landscapes collaborated with Pool Builders to create a curvaceous saltwater pool with a spacious deck, shady pergola, pretty water features, and a unique sunken seating area reached by bridge — or a quick swim. At night, moody lighting turns the backyard into a sophisticated spot from which to host intimate poolside parties. Always a conversation piece, the island transforms into a cozy place to enjoy the warmth of a wood fire — and a beer. “I spent so much time [in my backyard] last summer, especially under the covered pergola, in sunshine or rain. 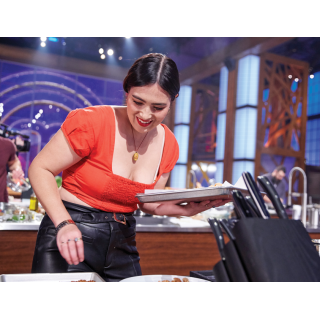 My family and friends also spent many evenings around the fire pit in the pool, with beers and laughter,” says Jingyu. 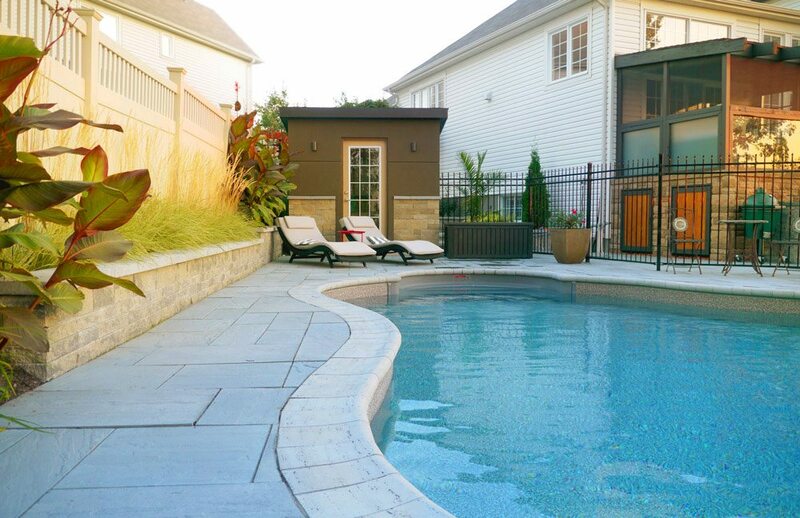 This Kanata backyard is jam-packed with entertainment features, including a mesmerizing pool, an outdoor fireplace, and — believe it or not — a putting green! Impressed by the work Exact Landscapes had done on their neighbour’s property, homeowners Laurel and Jason were keen to give their yard some TLC. “It was a mess, to put it simply,” says Laurel, noting the previous owners had added to the space in a piecemeal fashion. The transformation saw the installation of a full outdoor kitchen and dining area, as well as a fireplace for chilly evenings. 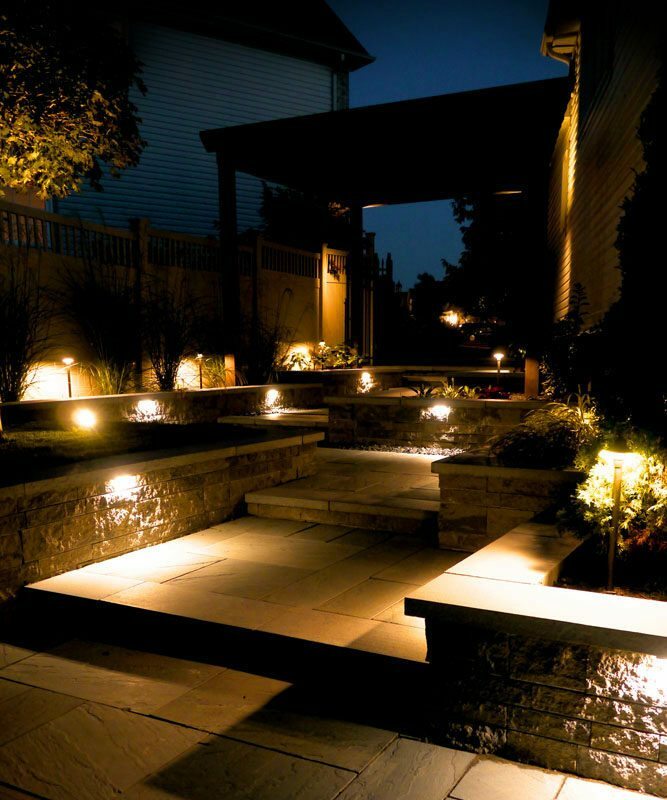 At night, lighting throughout the backyard ensures the party can continue till the wee hours. 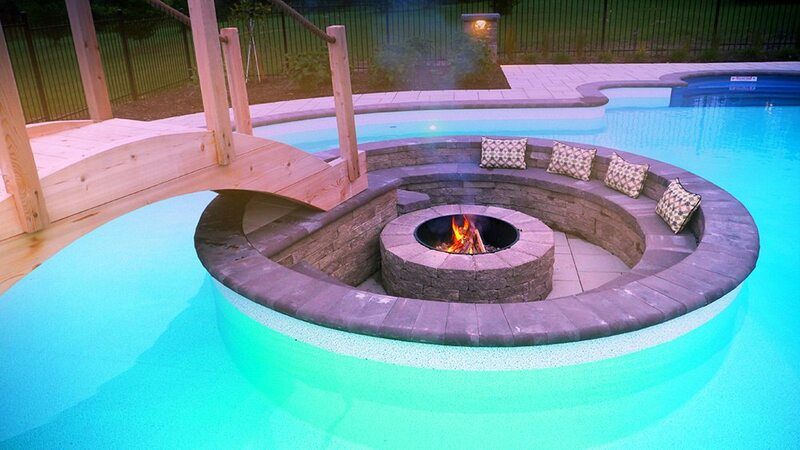 “Now, we can walk into the yard and sit by the fire pit and relax or lounge in a nice sunny spot by the pool. The yard space was used well and to the fullest. Even looking out the window puts a smile on my face,” says Laurel. To create privacy, Exact Landscapes tucked the pool house into a corner that faces the street and designed a handsome fence bordered with attractive grasses. 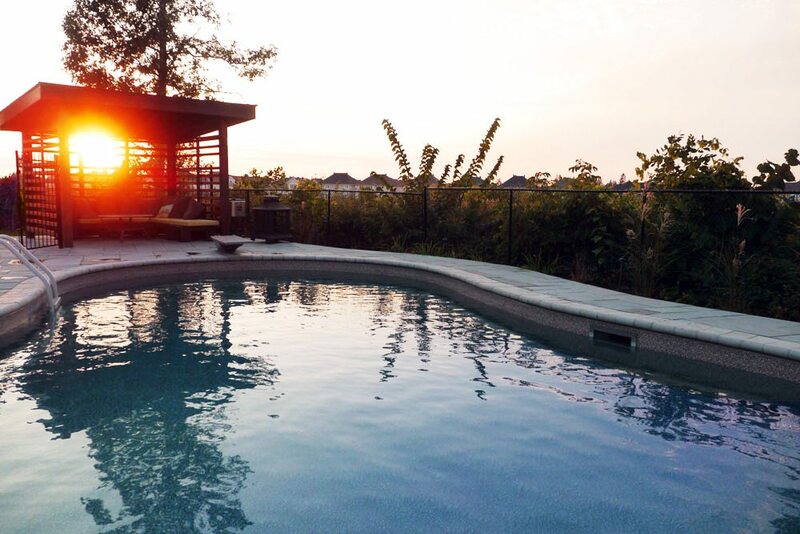 The distinctively shaped pool and patio make full use of the compact triangular lot. A tiered walkway along the side of the house makes for a suitably grand entrance to the pool area. 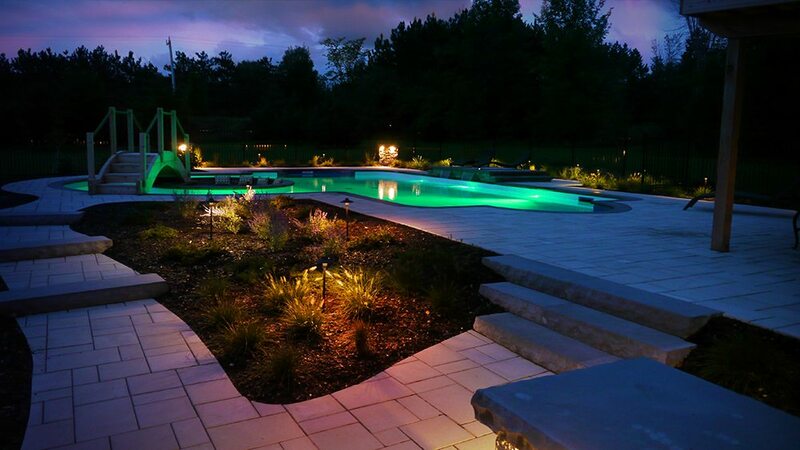 As dusk deepens, the lights in and around the pool create a warm glow. A graceful pergola at the far end of the pool creates shade and privacy for the owners, whose picture-perfect view is of the neighbouring golf course. This two-tiered backyard looks stunning from above and below. Exact Landscapes constructed a scenic curved pathway that winds its way down to the river, passing by a two-tier garden filled with ornamental grasses and wildflowers. Building that garden was no small feat. 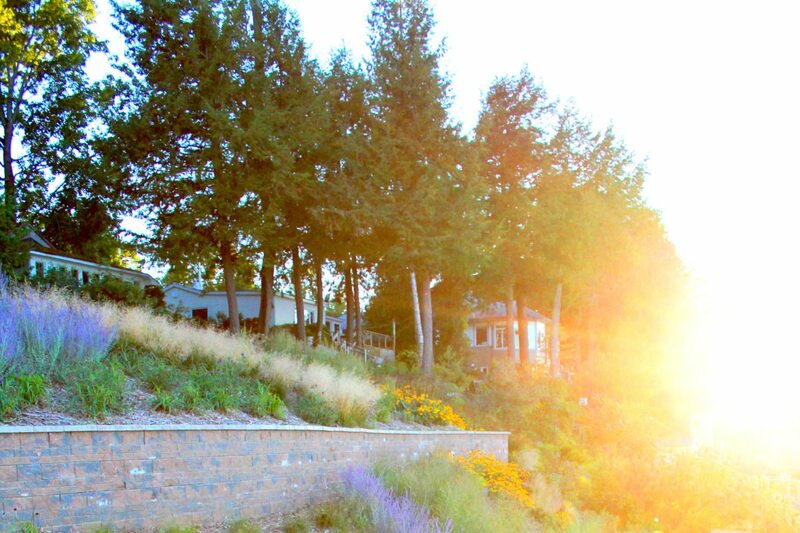 In order to move materials for the retaining wall and provide a safe working environment, Exact Landscapes parked a crane in front of the house, lifting loads of soil, stone, and mulch over the residence. The result was worth it: a variety of long grasses and bright perennials will blend into each other, providing a mature look in just one season. And no more mowing that steep slope! From the top of the hill, the owners enjoy a beautiful patio and cozy wood fireplace that looks out over the Ottawa River.